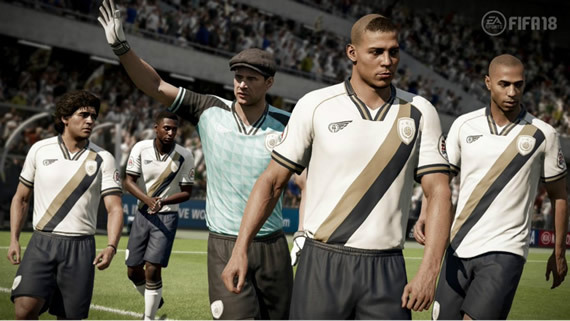 A new FIFA Ultimate Team “exploit” has emerged that some players reckon can’t be fixed. EA Sports restricts the number of Squad Battles matches you can play each week, and your overall placement is determined by the overall number of points you earn. So, you need to make the most of the matches you’ve got. That’s why players want to play on the hardest difficulty – appropriately called Ultimate – because that difficulty grants the most points. Onto the “exploit” (I wrap “exploit” in air quotes because there’s a debate about whether it should be called an “exploit”, which I’ll get to later). Players have found if they have a few bad (bronze) quality players in their team and use them to shield the ball from the computer, they can slow walk their way into a scoring position or convince the apparently impatient AI to commit a foul, which potentially leads to getting a few opposition players sent off. In short, the feeling is that bronze players are a bit broken in FIFA 18. It’s not clear why exactly this tactic appears to be effective, but it may have something to do with the hyper aggressive play of the AI in Squad Battles on Ultimate difficulty (which may itself be the result of all AI players being set to 99 in every attribute). This “exploit” appears to originate from a Brazilian FIFA 18 player who uses the name “HugeGorilaa” on PlayStation 4. HugeGorilaa came to the attention of the FIFA community after FIFA YouTuber Craig “Nepenthez” Douglas (yes, the very same YouTuber who was found guilty of two charges of illegal gambling) took to Twitter to question how he scored number one in the global Squad Battles leaderboard. Here’s where things get a little fuzzy. The FIFA community can’t decide whether this “exploit” is indeed an exploit, and so bannable under EA’s rules, or simply an effective tactic. Is it any different than using low driven shots, which appear to be the most effective way to score in FIFA 18 right now because the goalkeepers struggle with them? Is it any different than frustrating your opponent by passing the ball around at the back with no intention of playing it forward? Meanwhile, this “exploit” is spreading across the FIFA community, with YouTube tutorial videos popping up and Reddit threads enthusiastically discussing how it works. It’s no surprise to see this happening – Squad Battles on Ultimate difficulty is insanely hard. More FIFA 18 news will update at Mmocs.com, we will provide the cheap fifa 18 coins on PS4 and XBOX ONE in FIFA 18 Ultimate Team! FIFA 18 saw career mode finally receive some much needed changes, with the new transfer negotiations system being particularly refreshing. Now you actually meet with players and managers in cut scenes to negotiate deals which now means in-game faces are more important than ever. If you meet with a player and he looks nothing like himself with a basic template face, the illusion is ruined. You shouldn’t have to make that sacrifice and you don’t, there are plenty of career mode gems who also have real faces. Of course some of them, such as Kylian Mbappe and Gabriel Jesus, will force you to break the bank if you want a chance of signing them. But there are also some cheaper options who with time will also grow into international superstars such as Tottenham’s Marcus Edwards and Liverpool’s Ben Woodburn. However, there are some top prospects who are disappointingly missing real-game faces. The most notable of them is AC Milan’s 18-year-old goalkeeper Gianluigi Donnarumma who already has a high overall of 82 and potential of 94 which is the joint highest in the game shared with Cristiano Ronaldo, Neymar and Kylian Mbappe. Kylian Mbappe not only has the highest potential on this list but the joint highest in the game. It makes sense considering he just won the Golden Boy award, he is one of the biggest prospects in the world. His potential of 94 is shared with PSG teammate Neymar, Milan goalkeeper Donnarumma and FIFA 18 cover star Cristiano Ronaldo. Tottenham Hotspurs’ Marcus Edwards has the highest growth of every player on this list. Growth measures the difference between a player’s overall and their potential overall. Edwards can grow from a low 65 to a high 87, giving him an astronomical growth of 22. High potential doesn’t mean anything if that player doesn’t fit into your playstyle. If you want someone who will grow into a world class player who is also lightning quick, Leroy Sane is your man. The Germany and Manchester City winger is one of the fastest players in the game with pace of 94. And he also grows into one of the best players in the game with potential of 91. So you’re playing FIFA 18, and need some easy ways to make coins. Without coins, you cannot add quality players to your team, and you can’t buy a variety of other goodies that could help your cause in FIFA Ultimate Team. So how can you earn a lot of coins in the game without breaking your back in the process, and without having to spend any real money on coin-selling sites that might be dodgy all along? We’ve got three basic ways for you below, and we’re going to explain them in full detail; read on if you need to earn more coins with as little difficulty as possible! In FIFA 18, the easiest way to make coins is arguably what we would call the “organic” way. That means playing the game like you normally would, but to be more specific, we’re referring to playing matches against human opponents in Ultimate Team mode. A win in Ultimate Team will earn you about 400 coins or so, and as you keep racking up the wins, you’ll also notice the coins adding up. You should also get about a thousand coins or so if you top your division and get promoted. In addition to the regular matches in FIFA Ultimate Team, you can also take part in the weekly challenges and tournament. EA Sports regularly holds these specials for FIFA Ultimate Team players, and those who do well oftentimes end up with a solid amount of coins as part of the rewards. Then again, it all depends on the event — you can simply go to the Tournaments section on the Ultimate Team menu, and check it at least a few times a week to see if EA Sports has launched a new tournament or challenge. Even the regular tournaments reward 500 coins to those who win matches — that’s not bad at all, and as you may have noticed, that’s more than your usual reward for winning standard Ultimate Team matches. Play regularly, and better yet, play well in FIFA 18 — that’s an easy way to make coins, though the “playing well” part may still depend largely on the strength of your team. Not satisfied with the coins you can earn for winning matches? Fear not, because FIFA 18 comes with coin boosts, which you can unlock by means of EA Football Club Credits, or FCCs. Playing the game naturally will allow you to earn more FCCs, and you can then use these in the Football Club Catalogue. As you keep levelling up in the game, you will unlock different rewards from the catalogue, and these include coin boosts — the smallest coin boost available will add 200 coins to your post-match earnings for a limited period of time. Once you’ve got some coin boosts, you can then play FIFA 18 and expect to easily earn coins after you’ve applied the boost and taken on opponents in the online leagues. Each match victory will earn you at least 600 coins if you’ve got the boost activated, and if you also consider the possibility of topping your division and getting promoted to the next, just think of how far those coin boosts can get you. We’ve heard of players earning several thousands of coins per hour by doing well in the online leagues, meaning well enough to get promoted — that, of course, is the big caveat, but as you can see, the coin boosts do a world of good in themselves. 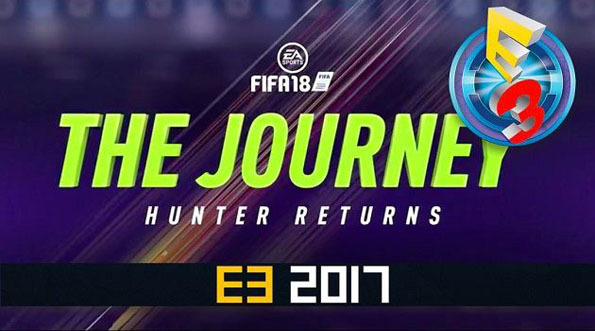 As any FIFA 18 player should know, the internet (especially YouTube) is teeming with videos and blog articles that could help you play the transfer market like a pro. Not only is this a great way to help you improve your team in FIFA 18, it can also be an easy way to make coins. That’s right — you can earn a fortune by playing the market, and employing tactics such as “sniping,” which is picking up good, yet undervalued players on a huge discount and reselling them at a higher price that’s more befitting of their talent. There’s also the technique of making multiple bids on several player cards of a kind, which is another good way to earn via the Transfer Market. If you play your cards right, you can earn quickly by this method, so read on for more specifics! When it comes to playing the Transfer Market in FIFA 18 as an easy way to make coins, mass bidding (as mentioned above) arguably stands out as the fastest method. First of all, you’ll want to be on the lookout for in-demand players who are cheap enough for a series of bids. 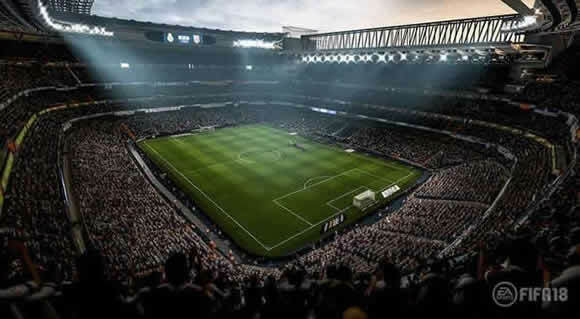 Most players suggest the Spanish La Liga and the English Premier League as the best places to look, and looking for players whose best positions include, but may not be limited to, center forward, left back, and/or right back. But regardless of which league you wish to look at, and which position you want to go for, the key here is looking for high-demand, low-supply players, but not those who cost way too much. How do you think these tips? Will you prepare some tips to help you earn more coins in FIFA game? Welcome to Mmocs.com to get cheap FIFA 18 Coins. EA Sports has introduced a new feature that represents one of the biggest additions to the Ultimate Team experience in recent years. FIFA 18 features one of the most significant additions to the Ultimate Team palette in recent years: Squad Battles. EA Sports has introduced a whole new means of earning both points and packs this year to bolster your ranks – and all you have to do is play matches. Goal has your complete guide to Squad Battles and how to make the most of the new feature. Squad Battles sees you take on AI-controlled Ultimate Team squads built by other FIFA players. Each competition lasts a week, with four new matches available to play once each every day (and a couple of extra sets thrown in at 17:00 UK time on Saturday and Sunday). By playing and winning those games, you earn points based on the difficulty level you have selected. The more points you earn relative to other FIFA players competing, the greater the rewards – which consist of packs and coins – you will take home at the end of each week. Some of the squads you will be challenged to beat are created by real-life stars, with Dele Alli’s featuring his own special 99-rated card. Points are earned in Squad Battles by winning matches. When you are ready to play a match, you will be asked to select a difficulty. Each difficulty has a multiplier assigned to the number of points that can be earned, with the hardest setting – Ultimate – multiplying your potential haul by 2.6 and the lowest – Beginner – halving it (0.5). It is not as simple as three points for a win, though. You will gain and be deducted points depending on a number of stats, including goals scored and conceded, passing accuracy, tackles and fouls. It’s worth weighing up, then, whether you might be able to score enough goals on a lower difficulty to outweigh the advantages of a higher multiplier on a more challenging setting. You’ll also want to take a look at the squad you’re facing. If it’s stacked with Lionel Messi, Cristiano Ronaldo and so on or has great chemistry, it’s obviously worth playing it safer than when you’re facing a mediocre opponent. At the end of each week, EA ranks all the players who have taken part in Squad Battles and assigns prizes. There are special prizes for the top 100 players in the world but after that, each rank is based on the percentage of players you have earned more points than. To get in the highest category outside of the top 100, for example – called Elite 1 – you will need to be in the top one per cent of all players that week. By participating in any way at all, you’ll get in Bronze 3 as a bare minimum and collect a couple of loan players for your trouble. The prizes get better and better as you go up the scale from there, though, and if you can break into the Gold and Elite categories you’ll be landing a decent number of coins and some potentially valuable packs. Replacing their regular cards in packs for a limited time, these black cards are assigned to a very limited selection of players announced on late September (Summer Edition) and early February (Winter Edition). Ones to Watch cards were a brand new card category in FIFA 17 Ultimate Team. They increase or not depending on the player’s form. Opposite to all other FUT cards, the OTW ratings and stats are not fixed. When FIFA 18 OTW Cards will be available? The OTW cards features top-players with less than 30 years old who moved to new clubs on this summer or winter transfer window. 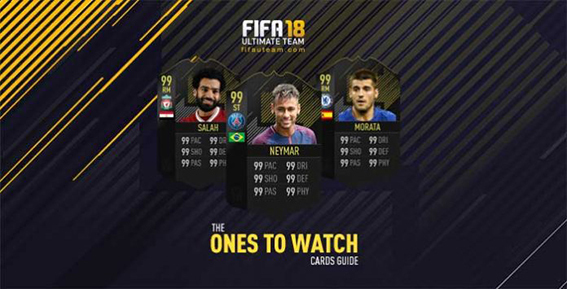 The Winter edition is released in early February, the Summer Edition of the FIFA 18 Ones to Watch cards will be available since the first day (September 29) for a few days. During this period, it is not possible to find the regular cards of this selection of players because the hybrid cards are replacing them. The ratings of OTW cards should be automatically updated as soon as a new TOTW card gets released. They are in form cards that have the stats of that players highest rated TOTW cards, In other words. They can’t go down. Their ratings just can go up. The FIFA 18 Ones to Watch cards boost in rating and stats every time a player gets a new TOTW card. What happens to the cards’ prices during the season? These cards give the game a fantasy football element. That’s why it is so difficult to predict the prices, The hybrid cards prices depend on how well the players performed and how many IF cards they get. Players have now to make many important choices, wit the hybrid cards in the game. What if a player doesn’t get the TOTW card you were expecting? When do you sell? do you buy a hybrid card right off the bat, knowing it will cost more than a regular card of an equivalent player? Do you cut your losses or do you hold onto the card hoping it will rise in value eventually? Whether it’s lag during matches or games ending abruptly, EA servers have come under constant fire from the FIFA community. 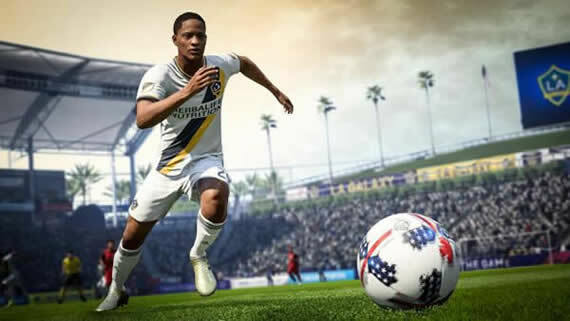 But speaking to Dream Team Gaming, EA SPORTS’ lead gameplay producer Sam Rivera says steps are being taken to make these issues a thing of the past in FIFA 18. Your internet connection may not be the only thing contributing to lag – your TV could be doing you no favours, either. Follow these steps to make sure your ready for FIFA 18 Ultimate Team. If you’re playing on your TV straight out of the box, chances are it’s got a host of flashy picture processors turned on. Sadly, these can affect input delay, so most now come with a ‘Gaming’ preset. These can be hard to find, but are usually found in the ‘Picture’ section of the ‘Settings’ menu. Note that some ‘Game’ modes still keep a few things, such as ‘Motion Blur control’ and ‘Noise Reduction’ switched on, so go through and double check they’re all deactivated. If not… well, you know what’ll happen. Look away now, energy savers. ‘Eco’ mode in TVs automatically adjusts the picture depending on light – but it’s way too aggressive and leads to an unnatural look that can strain your eyes. This doesn’t affect lag, per say, but switching it off is a quick way of creating a much more colour rich, detailed image – enhancing the overall experience. To improve contrast, make sure the backlight (if your TV has one) is set to 0 and contrast is NOT set to maximum. The latter will lead to less detail in darker and brighter scenes. Sure, it’s not as crisp as the Xbox One, PS4 and PC versions of the game – but FIFA on the Switch is by no means ugly. “We’re using physical-based rendering,” he said. “The crowds are 3D. The grass is 3D. The lighting is new. And on top of that you’ll have Ultimate Team for the first time on Nintendo – and for the first time you’ll be able to take it on the go. Right now, if you want to add a friend on the Switch you need to use an annoying 12 digit Friend Code. But that’s all about to change. Nintendo confirmed to Polygon that more ways to add pals are on the way – using the likes of Twitter, Facebook and the simple Nintendo Network ID. 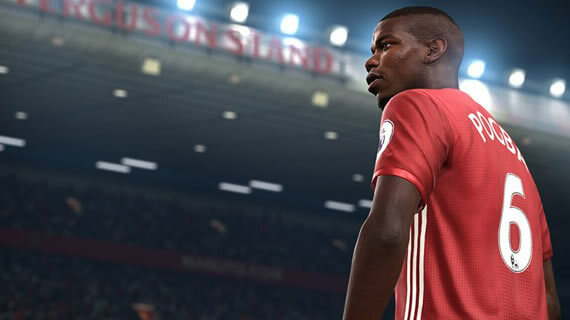 Expect FIFA 18 to have a custom interface for adding players – although no details of this have been announced.